All new for 2010, Bayliner's 245 Cruiser is the smallest of its six model Cruiser lineup extending to over thirty-three feet. Maybe the smallest, but the 245 is packed with features galore for the growing young family starting out or the empty-nester boaters moving down from a larger cruiser. Entry to the 245 is easy via the integrated swim platform and wide cockpit door leading to an uncluttered cockpit. A commodious portside L-shaped lounge is adaptable for either forward, side, or aft viewing and features built-in cupholders and armrests. A removable cockpit table services this lounge seat. A cooler is neatly stored beneath it. A single, thickly padded helm seat affords excellent visibility through the curved and smoked safety glass windshield. Standard instrumentation is readily visible while the centre dash portion is left available for your choices of navigation electronics. The entire cockpit floor hinges upward with gas strut assists to provide easy engine access for maintenance. Inside the cabin, real wood adds warmth and a quality feeling to the galley cabinetry and the removable V-berth dinette table. A filler cushion converts this V-berth area to a spacious and airy sleeping area for the owners and offers additional storage below its seating areas. Brightly coloured fabrics adorn the mid-berth while a portlight adds natural lighting and ventilation to please the kids or adult guests. The enclosed molded fibreglass head compartment features a standard vanity with sink and faucet, towel rack, storage, portable head, and opening portlight for ventilation. Standard power is provided by a MerCruiser 5.0L, 220 HP carbureted sterndrive. If your boating includes carrying lots of passengers or gear, or even upscale watersports, perhaps choose the optional multi-port fuel injected 260 HP MerCruiser with either the Alpha I or Bravo III outdrives. A factory trailer is optionally available for those so inclined, as are camper back canvas, 110 VAC dockside power, a marine head and holding tank, and even air conditioning/heating. 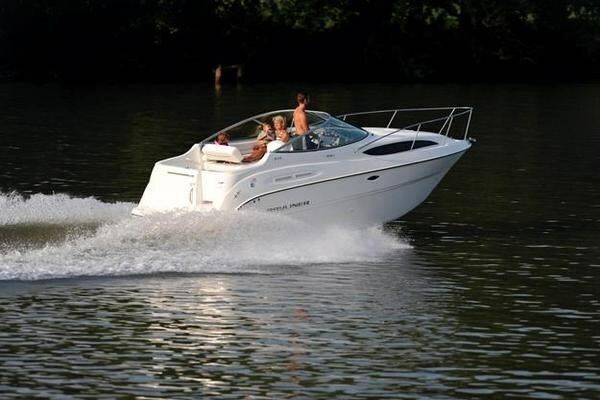 All in, this Bayliner 245 Cruiser offers a lot of affordable cruising in a very manageable package.